Cast iron skillets are one of the most versatile pieces of kitchen equipment out there and are durable, easy to clean and budget friendly. This guide covers the best cast iron skill brands you can buy. If that wasn’t enough, they also distribute heat more evenly than other cooking receptacles and function as indoor “grills,” making them perfect for urban dwellers who don’t have access to an outdoor space. Cast iron skillets are generally used to cook steaks and other meat-based dishes but that doesn’t mean they don’t have a place in the vegan kitchen as well. They are ideal for making veggie stir-fries and veggie burgers as well as searing tofu or t﻿﻿empeh steaks and whipping up pad Thai and Asian fried rice dishes. They are even good for heating up paninis, grilled sandwiches, Naan and other flatbreads. If you love vegan barbeques but don’t have access to a grill because you live in an apartment, then buying a cast iron skillet can help you replicate delicious vegan BBQ flavors without having to move house. Using a cast iron pan, you can have grilled eggplant, zucchini and pineapple rings without having to shell out on a barbeque station. While cast iron skillets are best known for cooking meat, they make wonderful veggie cooking receptacles. You can use them to cook anything from pumpkin fritters, vegan stir-fries and grilled eggplant -the options are limitless! In fact, they are ideal for frying veggies, searing tofu/tempeh and heating up bread and tortillas. This is because they are made from non-stick material that allows you to prepare food without worrying about messy cleanups and food getting stuck to the bottom of the pan. Cast iron pans are economically viable because they are built to last. It isn’t a coincidence that you see so many ancient models at antique fairs and flea markets. These things can stand the test of time! They also make great teapots for loose leaf tea! Although there is a popular misconception that cast iron skillets are hard to maintain because they need to be seasoned, the truth is that most modern models come pre-seasoned, meaning you no longer have to worry about doing it yourself. Note that there are some models that require to be re-seasoned every now and then but this doesn’t take long and is easy to do. If you don't want to bother with seasoning at all, we recommend checking out an enameled cast iron pan. Pre-seasoned models mean that the skillet has been coated with a thin layer of polymerized oil. This means that it has been rubbed with oil and heated repeatedly until it has been broken down into a plastic-like substance that has bonded to the surface of the metal pan. 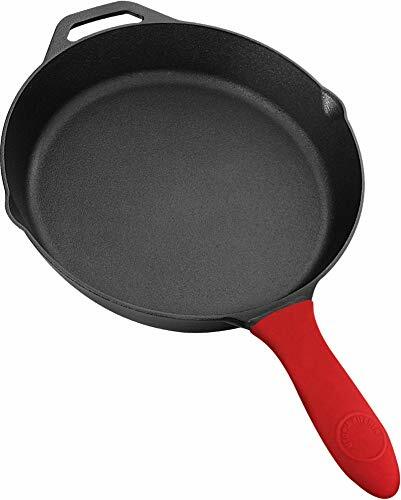 This is what gives cast iron skillets their amazing non-stick properties and allows them to go through repeated ware and tear without showing signs of aging like other varieties of pots and pans. 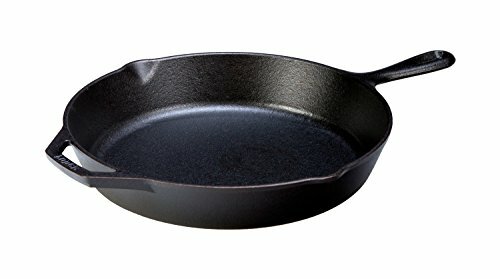 The seasoning on cast iron pans is what makes them so hardy and resilient so make sure to buy one that comes pre-seasoned. High quality models will even take being scraped at by metal scourers and stainless steel cooking spoons without chipping or flaking. While these amazing kitchen devices are good for frying, heating and searing, they are not ideal for boiling or simmering. This means that if you want to make tomato sauce or boil up some soup or stew, you’re better off sticking to a large pot. Modern cast iron skillets rarely come pre-seasoned as this makes them high maintenance and difficult to treat. We have chosen five of the best pre-seasoned models and taken the guesswork out of choosing the right one for you. Most cast iron skillets have flat surfaces although there are some that come with ridged bottoms. While this is generally a key component in searing bacon, breakfast sausages and steaks, the general idea behind ridged pans is to drain the grease off your food, making it healthier to eat. The same idea can be extended to vegetables and vegan dishes. If you want to make Pad Thai, fried rice, plantains, v﻿eggie fritters, tofu or tempeh steak but are worried about the high calorie content, a ridged pan will help drain off the oil so that your meal is lighter and less calorie dense. As a side note: another option to get a charred finish without the need for much oil is a grill basket for vegetables​. The Lodge Company is one of the most trusted names in cast iron cookware and is over a century old, making them veterans in the industry. The ribbed bottom makes this pan ideal for healthy, lower fat cooking and comes pre-seasoned and ready-to-use. It is adept at retaining heat and keeping the pan well insulated so that it cooks your food evenly. The ridges make this ideal for searing tofu and tempeh and letting the fat drain off fritters and stir-fries. The ridges also make it ideal for heating paninis, grilled sandwiches, tortillas and Nan bread, as they leave a ribbed markings on your food. This model can be used on all cooking surfaces –from basic stovetops to campfires, grills and ovens. The black patina finish given to this cookware is made from high-grade vegetable oil that is durable and rust resistant. This model can be used to make and heat any dish you want and is particularly good at searing tofu and tempeh and making pan-marked veggies for fajitas. It also works well for making Asian-inspired stir-fries and rice and noodle dishes. This flat-bottom Lodge model comes pre-seasoned and features an assist handle so that you can easily carry your pan with two hands. Cast iron skillets are extremely heavy and so having the extra handle makes it a lot easier to manage. The flat, smooth bottom means that you can use this model in the oven to bake apple pies and other desserts while also using it to make stir-fries and heat bread on your stovetop. The seasoning is made from high-grade vegetable oil and features no synthetic chemicals. This pan is designed to become better the more times you use it. Although this is not ribbed at the bottom, it can still be used to “barbeque” veggies and other food, although it will not leave any markings on your food. This doesn’t affect the flavor in any way and choosing between this model and a ribbed one is all about deciding whether your think you’re going to use your skillet to bake as well as to fry, sear and heat. If you’re looking for a model that can also be used for baking then this makes a great choice. Flat surfaces are also ideal for making pancakes, biscuits and flapjacks. The silicone handle means that this pan is never too hot to handle and allows you to pick it up without the use of an oven mitt. This in no way compromises the pan’s ability to heat food evenly and the main body stays hot for extended periods of time. The cast iron finish does not leech chemicals into your food and the seasoning is made from high quality soy-based oil, which allows the polymers to create an initial layer of seasoning. The flat surface makes it ideal for heating bread, making pancakes and v﻿egan French toast as well as Asian-inspired favorites like stir-fried veggies and Pad Thai. This is a fantastic, high-quality pan that gives you a lot of bang for your buck. The only drawback is that you must re-season the pan with oil after each use (particularly if you are washing it with water) as this helps keep it in tip-top condition. The silicone sleeve handle can be removed, which makes this pan good for all kinds of surfaces and can be used in ovens, on stovetops, grills and campfires. Be careful if you have a glass-top stove as this may scratch it. Australia is a country known for its outdoorsy lifestyle and culture. That means that they know a thing or two about how to craft a high quality cast iron skillet that will deliver on all gastronomical fronts. This is a one of the best skillets on the market for cooking all kinds of veggie burgers –from soy-based varieties to all-vegetable and walnut burger patties. It also tackles other standard fare like bread, pancakes, vegan barbecues, stir-fries and tempeh steaks. 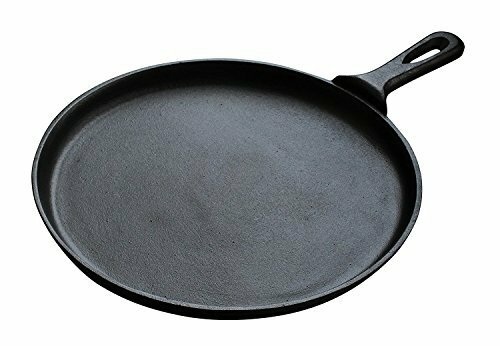 Like most high quality cast iron skillets, this one can be used on top of grills, stove tops and even put in the oven to make baked goods. The one problem with this pan is that it is prone to rust over time, but this can be avoided if you care for it properly but scrubbing it down with water and salt and then re-seasoning it. This is an excellent, high-quality cast iron skillet with superior heat conduction that warms your food evenly and thoroughly. It is pre-seasoned with high-grade vegetable oil and no synthetic fillers or additives that could leech into your food, potentially harming your health. The handle is sturdy and strong and comes with a hole in it so that it can be hung up or put away in a drawer or cupboard for easy storage. While this is a great pan, it is not ideal for large volumes of food or for stir-fries and vegan barbeques. Its wide, flat surface is better suited to making pancakes, warming bread, flipping veggie burgers and searing tofu steaks. This is a great pan for preparing certain things but it is not the most versatile option out there. Having said that, it can be placed in the oven, used on stovetops and placed on top of grills but needs to be handled with a good oven mitt as the handle gets extremely hot. All the cast iron skillets featured here were cherry picked for their high quality and durability, however, it was the Lodge Pre-Seasoned model that came out on top. The ridged design makes it easy to clean and ideal for people wanting to watch their weight since the ridges help drain away excess oil and calories. 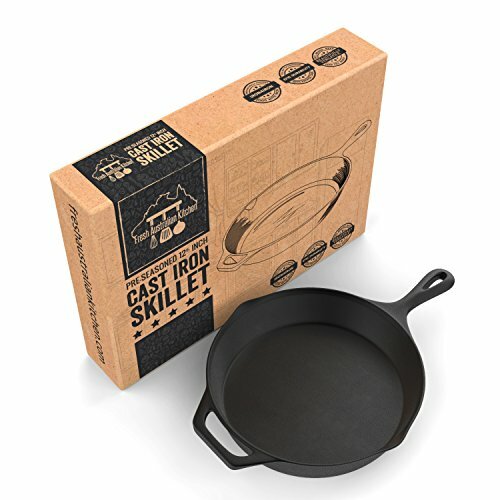 If you are looking to buy a cast iron skillet that you can rely on, this is the perfect fit for you!